We just borrowed a whole bunch of children’s books from our local library and one of them is called This Little Piggy’s Book of Manners by Kathryn Madeline Allen. 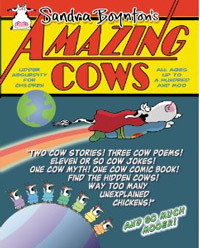 Looking at the cover, would you guess there’s a cow in this book? Alright, I wouldn’t either but that’s why they say you can’t judge a book by its cover. This book is about learning the difference between good and bad manners, using the example of two little piggies who tend to behave quite differently. A cow appears on two different pages in this book, and unfortunately it’s associated with the misbehaving little piggy every time. If you’ve never seen a cow driving a car, now is your chance. Don’t blink! And look at this pig, eating like… well, like a pig. The poor cow is utterly disgusted. This little piggy eats like a pig! 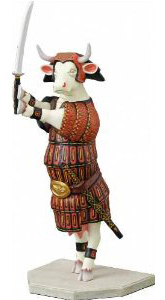 Next Post Ready to make your own bull?